Elevated TSH Levels: To Treat or Not to Treat? Physicians are accustomed to checking thyroid-stimulating hormone (TSH) in older adults with symptoms of an over- or underactive thyroid, as it’s a fairly accurate and routine measure of thyroid function. But a new study suggests that for many patients, treatment for mild TSH elevations may no longer be warranted. The study, accepted for publication in The Endocrine Society’s Journal of Clinical Endocrinology & Metabolism, questions the assertion that slightly elevated TSH levels are linked to an increase in mortality and suggests that such elevations may actually be a normal part of healthful aging. The study first examined 5,888 men and women aged 65 and older between 1989 and 1992. Then in 2005, researchers reexamined 843 surviving participants’ thyroid function for any changes in physical and cognitive function. Study participants ranged in age from 77 to 102, with a mean age of 85. “We found that levels of TSH gradually increase during the aging process, which means that more older people are outside of standard reference ranges and could be labeled with the diagnosis of subclinical hypothyroidism,” Cappola says. “However, older people [mean age of 85] with subclinical hypothyroidism did not have a higher death rate and, if anything, there was a suggestion that having subclinical hypothyroidism was protective. Cappola says elevated TSH levels are relatively common in older adults, seen “in approximately 15% of US adults aged 65 and older, and it’s more common in women than in men,” she says, noting that previous research suggests it becomes more common in patients in their 70s and tends to run in families. Cappola notes that older adults with only a mild elevation in TSH are unlikely to see their levels progress to a dangerous level. “We have shown in previous studies that the mildly elevated TSH level tends to persist or revert to normal and rarely progresses to a dangerous level. Others have shown an annual rate of progression of 2% to 4%,” she says. “An important point is that for elderly patients, and increasingly as the patient ages, doctors need to think carefully about both the indications and ramifications of any treatment,” notes Rosemary Laird, MD, MHSA, AGSF, medical director of the Health First Aging Institute and past president of the Florida Geriatrics Society. “Certainly, with subclinical disease there is no perceived loss of quality of life, so treatment of any kind should be carefully considered. For clinicians, these results support watchful waiting and serial reassessment for most older adults with only mildly elevated TSH levels. It even suggests some evidence of potential harm from higher levels of thyroid hormone, so all the more reason to carefully choose one’s response to mildly elevated TSH,” she posits. 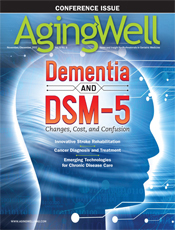 “We can also use this [study’s findings] as a reminder that geriatric care needs to be care that is individually tailored and reactive to an individual’s overall quality of life and life expectancy, since both of these foundational pieces of information make the difference in clinical decision making,” Laird adds. It is Cappola’s hope that these findings take hold in the clinical community, prompting geriatricians and primary care physicians to think twice before treating their much older patients for such mild elevations that, in her opinion and from recent evidence, prove unlikely to do any harm on their own while focusing instead on those with more aggressive leaps in TSH.